So here it is: first page of my 'All about ME' album. This page has been created for a project with S'CGBM and the title is All about me. I am more used to creating pages of other people's photos so I found it difficult to put 'me' as the focus of the scrapbook page. So to break the spell I cut strips of coloured papers and made an oval frame for the photo, making me the main feature. Oh dear, can't get used to this much attention! I don't have many old photos and this is the first one the surfaced in the hunt for scrapbook worthy material. A school photo, taken in about 1964 or 65 shows me in my hand-knit jumper, hair not as tidy as it should be and not looking at the camera. I hated having my photo taken. Even now I not that keen. Looking at the photo I am reminded that I liked school. A lot! I think I was a bit of a swot. The poor Sisters of Mercy nuns in the convent school tried desperately to make a 'young lady' out of me and failed spectacularly. Thanks for stopping by and don't forget to leave me your comments. Gosh i love your first layout for the ALl About Me Book group - i think ill have to call it AAMB group for short !! the strips of paper are a fabby idea - love it and thanks for sharing - looking forward to seeing what else you create for our future challenges. Hi Angela, I love your layout for the All About Me Book Group. 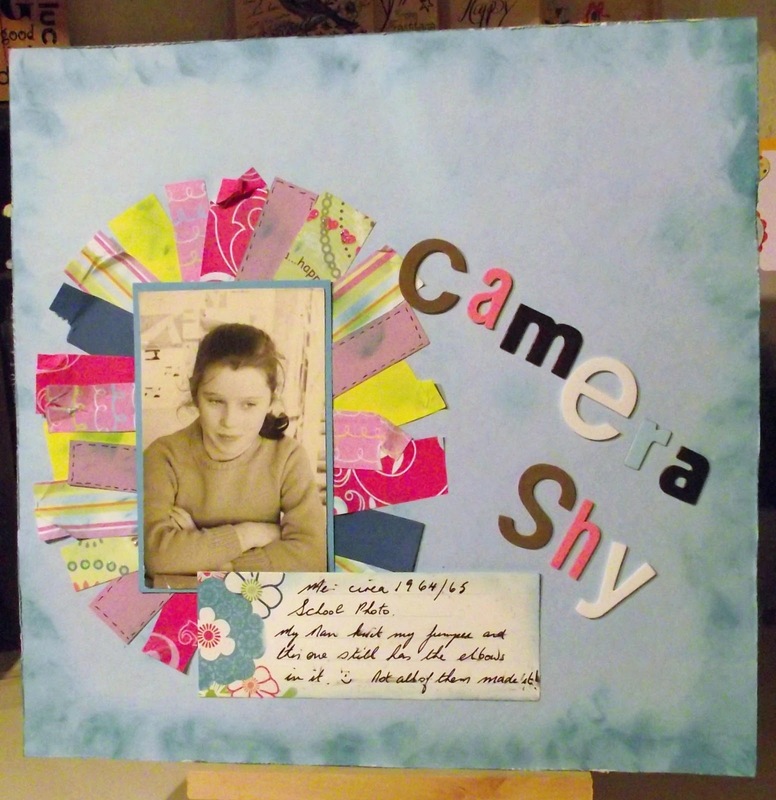 This is my first foray into scrapbooking and really enjoyed doing my first page too. I love the papers you have used and the lettering is fabulous too. I look forward to seeing more of your work. It is hard doing ones of you! I like scrapping others too - but that is a beautiful LO, the strips work really well and the blue inky background is gorgeous.